We’ve created an intergenerational resource with the Older People’s Commissioner that aims to encourage schools and groups of older people to establish Intergenerational groups. The resource can be downloaded and used as a lesson plan in schools. Why should my school start an intergenerational group? Well, having an intergenerational project can be a really positive way of breaking down barriers between younger and older people, of learning new skills, and of boosting confidence and wellbeing. 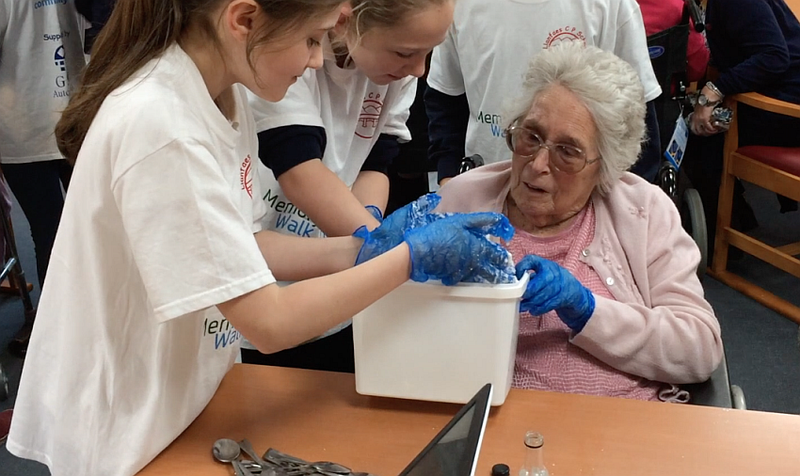 We’ve made three videos that show the positive impact intergenerational projects can have, and a lesson plan to help teachers to explore the possibility of starting an intergenerational group with their pupils. You can download the intergenerational lesson plan here. At Ysgol Plascrug, Aberystwyth, residents from Tai Ceredigion join pupils to play games and to interact. Pupils from Llanfaes school in Brecon join the residents of Trenewydd Care Home, who live with dementia, once a week to play games and to take part in activities. The project recently won a National Alzheimer’s Society award in the category of Young People’s Outstanding Contribution, recognising the excellent partnership between the care home and Llanfaes school. Pupils serve food to older members of the community and eat with them in a weekly lunch club. We’d love to hear from schools who’ve used this resource. Please send us a tweet to let us know how you get on.